Top-Rated Cotton Salon, Gym, Hand Bleach Proof Towel Set! This pack of 24 Bleach Proof Cotton blend towels is a popular and economical choice when stocking your beauty care business, spa, nail spa, dorm or home bathroom. Each 16x27 inch hair towel is extra absorbent and practical for drying your hair quickly. The 100% Cotton terry cloth fabric delivers optimal softness and long-lasting quality. Professionally hemmed edges are carefully graded for quality control and product durability. Towels are very absorbent and will remain soft after multiple wash and dry cycles. These bleach-proof salon towels resist all type of bleach and peroxides. They are color safe when washed with hot water or chlorine bleach to remove stains of hair dyes, bronzers, make-up, lotions, other chemicals, germs, and bacteria. Perfect for business or home use. Ringspun Cotton provides optimal softness and absorbency. Perfect for bathing, hair care, etc. 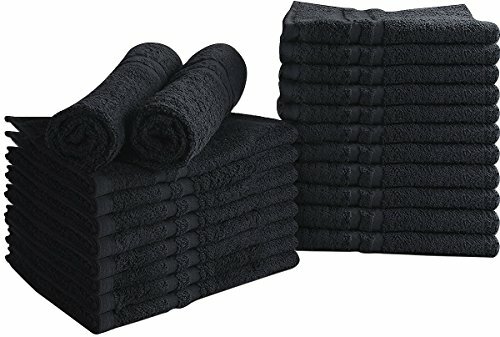 These quick dry towels are perfect for your salon, gym, spa, pool, etc.